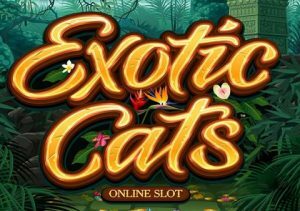 Venture deep into the wild jungle in Exotic Cats, a 5 reel, 243 ways to win video slot from Microgaming. The cougars, leopards, panthers, tigers and lions can each explode into life and turn a whole reel wild. Also on offer is a bonus round that awards up to 15 free spins. Play on your computer, laptop, tablet or mobile from between 15p and £30 per spin. A lush, green rainforest forms the backdrop to the action in Exotic Cats. You’ll see gem-style playing card suit symbols spinning around the reels alongside paw prints and a mystery woman. Central to the action are the 5 exotic cat symbols. Each 1 of the cougar, leopard, panther, tiger and lion has its own symbol and associated reel. Land a cat symbol on its designated reel and it expands to turn the whole of that reel wild. For example, say you landed the tiger symbol on its associated reel (in this case reel 2) it would spring into life and deliver a stacked wild. It’s possible to land more than 1 cat on its designated reel on the same spin which can lead to some potentially spectacular results. This is known as the Vertical Wilds feature. The other main extra on offer in Exotic Cats is the Free Spins feature – to trigger it, you’ll need to land 3 or more scatters on the same spin. You can then look forward to 10 free spins. 5 free spins are added to your total if you manage to land 3 or more scatters on the same spin during the feature. The vertical cat wilds are in play during the feature too meaning you could get 5 wild reels on every free spin! The name of this video slot might be Exotic but the gameplay is actually very straightforward. The vertical cat wilds certainly pep up the action and the free spins round offers some solid potential. This isn’t the most volatile game either – saying that, you can win 3,533 times your bet on every spin! A video slot with Exotic in its name might conjure up thoughts of wild, outlandish action. You won’t find that here. Exotic Cats is in the middle of the pack when it comes to design and gameplay. If you enjoy the animal theme, then it offers just enough to make it worth investigating. I also recommend you try NetEnt’s Jungle Spirit: Call of the Wild which looks better, has more in the way of features and is more volatile.